Milton Keynes College is proud to be offering a brand new college training programme, located at our commercial barbers within The Graduate salon. Having been the first college in Europe to be awarded Academy status by Wahl, the College will be providing barbers and hairdressers with the fundamental support and skills required to succeed in the industry. 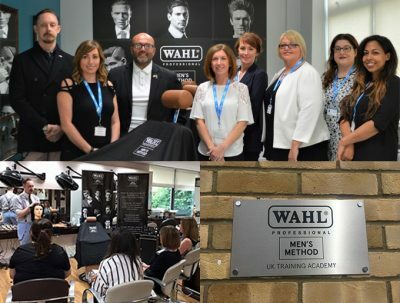 Only a limited number of Wahl Men’s Method UK Training Academies will be approved each year, so this is great news for barbers, hairdressers and their clients in the Milton Keynes area, as MK College will now be offering one of the top training programmes in the world. Maria Bowness, Head of School for Hair, Beauty, Hospitality and Events, was delighted by the news. She said: “This is a huge honour for MK College and the culmination of a lot of hard work by our team here, we have supported Wahl with setting up the “Mens Method” for the European market after it was brought over from the USA. Established in 1919, Wahl is an international leader in the manufacturing of products for the professional beauty and barber salon trade, operating in over 165 countries. Milton Keynes College offers a wide range of courses specialising in hair, beauty and barbering. Find out more about the full range of study programmes or discover the services available at The Graduate salon. Our operating hours may vary out of term-time, please call us on 01908 684102 to confirm.